In transforming a 16th century-Czech Republic residence into this guesthouse, local studio ORA celebrated an assortment of original details including old plasterwork, semi-circular windows and stone steps. The Štajnhaus Guest House is located in the former Jewish quarter of Mikulov, a town in the Czech Republic's South Moravian Region. The original property was built in the Czech Renaissance period – the completion date is not known, but it dates back as far as the 16th century. However it had undergone a series of alterations over the years. Locally based ORA, which stands for Original Regional Architecture, stripped out the later additions to expose several types of brickwork and an old layer of plasterwork "buried under 10 new ones". "The house had been badly changed throughout time and also the communist regime," architect Jan Hora told Dezeen. "But a lot of details had been kept hidden in underlying layers." The renovation was designed for a city dweller moving from Prague to establish a holiday-home business in the old town. The brief was for a guesthouse and residence for the client. During the overhaul, the studio discovered many unexpected elements, like old openings, and so had to alter the design as they went. They tried to arrange spaces around these uncovered details, which include a set of old stone steps. The new interventions are intended to be subtle to create a seamless interior. "As the construction site continued, we were surprised what had appeared," said Hora. "The project needed a continuous revision because we wanted to preserve as much as possible." "The main concept was to keep the design as an organic complex," he added. "You can't easily recognise what is old and what is new." High vaulted ceilings top the main entrance hall and a guest bedroom, which features yellow flooring, and twin beds with rounded frames. Windows, which had been altered from their original quirky form, were reinstated. They includes a pair of semi-circular openings at the top of the property. 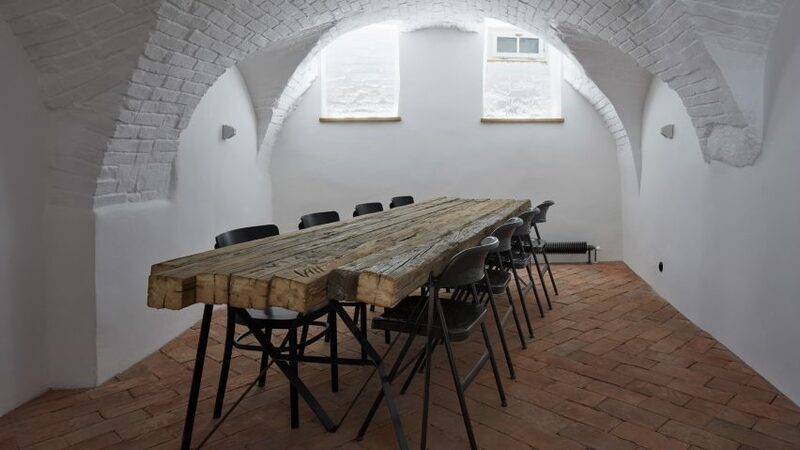 The old vaulted brickwork wine cellar is also restored back to its original use. Other new additions include wooden ceiling beams and a wooden box, which is occupied by a guest bathroom. Finishes in the property also work to complement the history. Tiles and furniture are made out of recycled wooden beams and bricks. Bed frames and lighting are made out of lightweight rough steel, which the studio has shaped into "abstract frames".